The bold curved design of this robust seat make it suitable for any contemporary civic pedestrian area, park or garden setting. 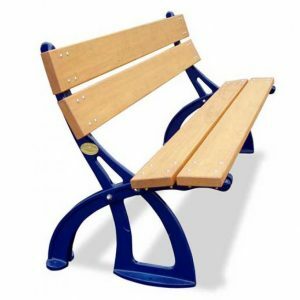 The PARK LANE seat is available in a range of colours and seat lengths. The seat ends are made from cast aluminium (CC601) making it light weight and easy to assemble and freight. Vandal resistant design and construction. Shipped completely knocked down in an ecomonical flatpack. Durable, all fixings are 316 stainless steel. Cast Aluminium ends with hardwood or Accoya slats. Finish: End castings finished in any BS colour. Slats treated with exterior preservative. Fixing: Pre-drilled holes for secure bolt fixing to concrete. Slats secured with SS 316 bolts.